So that's the end of the road for this live text, thanks for your company and interaction. Only a couple of hours to go until our next football text coverage, with Manchester United facing Barcelona and Chelsea playing PSG in friendlies that wouldn't look out of place in the Champions League semi-finals. Northern Ireland won just one of their World Cup 2014 qualifiers (D4 L5), but have won four of six in Euro 2016 qualification. Upturn. Wales took 10 points from their World Cup 2014 qualifying group. In Euro 2016 qualification, they have 14 points already. Top. You can read our developing story of the draw here, with reaction from a few managers. If you want to read the African draw, here's the link. Roy Hodgson on whether he will still be England manager for the 2018 qualifiers. “It is a great honour to be England manager – I shall be delighted to retain that position all the time people want me too, but it won’t occupy my thoughts at this point in time," he told BBC Radio 5 live. "I'm pleased to come away with a good group and if England want me to lead the team I will be delighted to do so. "If we can come through Euro 2016 without too many tears being shed I believe we have a good chance of qualifying for 2018. "It is positive, so many other groups would have been more problematic, not least for fans travelling, some are not such easy countries to get to, but we’ve been drawn not only nice places but easy to get to as well." This is the 20th World Cup qualifying campaign. The inaugural 1930 tournament was invitational.Image caption: This is the 20th World Cup qualifying campaign. The inaugural 1930 tournament was invitational. Nathan in Belfast: Disappointed Northern Ireland got landed with Germany but we could make a dash for the play-offs if we can take points away at Norway at Czech Republic. Although let's qualify for Euro 2016 first! Because England had to be in a six-team group for commercial reasons, it became obvious they'd have to be in Scotland or Italy's group. Roy Hodgson told BBC Radio 5 live: “I don’t want to suggest Italy are stronger than Scotland, but we have played a lot of games against Italy recently and I thought that group with the rest of the teams in it looked more tricky than the group we have found ourselves in. "We know Slovenia and Malta are very keen on English football, while Slovakia from the second pot, although they have had a good spell, maybe do not have the allure of France and Italy, who may cause us more problems." England boss Roy Hodgson on BBC Radio 5 live: “To be fair there is always a chance we were going to get a local derby with Scotland, Northern Ireland and the Republic of Ireland all a possibility. “The Scotland fixture really does excite people. We have got recent experience of what the atmosphere will be like. The games will excite the public, get people in the mass media excited too, it is a good draw all round – I think Scotland will be happy with it and we are happy with it." Alistair: Scotland need to block out that friendly last year 60,000 Scots fans treated like a World Cup final when England's B team (featuring Stewart Downing) beat them 3-1 while playing at 25%. Donald in Ellon, Aberdeenshire: Scotland nothing to lose. England everything to lose. Bring it on! Steve: At least Scotland get their little World Cup final without even getting there. Reaction from England boss Roy Hodgson coming up soon. "Germany are not unbeatable, they've shown that in their Euro 2016 group. They're struggling against Poland. Northern Ireland had that brilliant run of form but it'll be tough for them. Czech Republic are a good side. There was a time Northern Ireland might slip up against the minnows but they won't have a problem with San Marino. "I have such a positive feeling about all the home nations and Republic of Ireland." "In previous times there would be meetings between officials and coaches to work out the fixture lists. But now it's all worked out for them." Ex-Republic of Ireland striker John Aldridge on BBC Radio 5 live: "It's an interesting group. With all due respect to Wales you think fantastic, we haven't got Germany, Netherlands or Spain - no big boys. Austria are coming good - they go around in cycles. It's a cut-throat group, anything can happen. "Robbie Keane is getting on and there's nobody coming through in that area. That's a major worry. Nobody is playing in the big teams in the Premier League. All the players give their all but at the moment we're very ordinary." "England are used to easy games being in pot one. Scotland get more difficult games in pot three. We will not be overconfident and not too arrogant but it'll be a special one. I'm looking forward to those games already." Wales boss Chris Coleman on BBC Radio 5 live: "We're looking forward to it. Some good teams in there. It's never easy going to places like Moldova and Georgia and we know about the quality of Austria, Republic of Ireland and Serbia. "But we've really improved in the last three years. We fancy ourselves against anyone. You look at other groups - it could have been easier or tougher. There's a lot of football to go in the Euro 2016 qualifiers before this. "This has been the biggest honour of my career. My sole focus is on leading my country to France. After that I'll look at what's next. "We've had a bit of fun being in pot one. It's new for us. We've really enjoyed it." "Wales have been improving - they should be delighted with what they've got. Derby games have a habit of throwing up a strange one. Moldova and Georgia should be beaten. Serbia might the the most dangerous one in that group. If Wales play to their best, they have a chance of winning that group." In case anyone wonder where Gibraltar are in all of this, they're only members of Uefa - not Fifa - so aren't eligible for the World Cup. The feed on this page and BBC Red Button has ended now. But we will keep our World Cup debate going on for a bit longer. The Fifa show is continuing with Russia's 2015 Eurovision entry, A Million Voices, sung by Polina Gagarina and the St Petersburg childrens choir. Obviously I had to google that. Oliver Bierhoff says he was happy Germany avoided Italy. Aleksandr Kerzhakov says there are no favourites and he's happy Russia don't need to qualify. So England and Scotland in one group together. And Wales play Republic of Ireland in another. Northern Ireland have Germany and Czech Republic. Here we go. We're drawing out pot six (the minnows) first and working our way up to the top seeds (England and Wales). Russia's all-time top scorer Aleksandr Kerzhakov is on stage. Says they'll "rightly hold the World Cup". 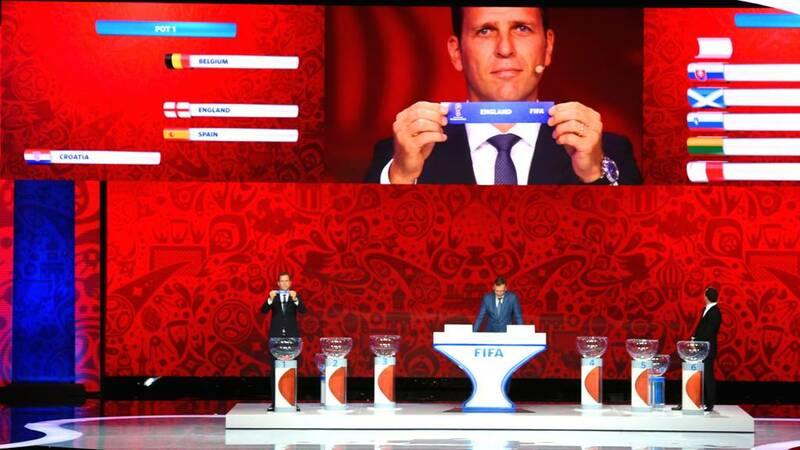 Ex-Germany striker Oliver Bierhoff is the other draw-er. I'm not going to tempt fate by stating who England might want to play or avoid and besides, that would be disrespectful. We've seen in the recent Euro 2016 qualification period that virtually all competitive matches are difficult. There won't be many teams in today's draw who have had as meteoric a rise as Wales. They were ranked 117th in August 2011, but less than four years later they are top of their Euro 2016 qualifying group as they bid to reach a first tournament since the 1958 World Cup. They are ranked 10th in the world and top seeds today, alongside England. Format might be familiar to you by now. One team from each pot drawn into a group. Two groups only have five teams (nobody from pot 6). The bigger countries, including England, can't go into a five-team group for broadcasting/commercial reasons. Russia qualify as hosts, with Europe's other 52 teams being drawn into nine groups (seven of six teams and two of five sides). The top team from each group qualify with the eight best second-placed sides playing off. Now Antarctica qualifying - this is where it gets really interesting. All 15 teams go into three pots of five and then... OK there isn't really Antarctica qualifying. Some jazz now. European draw starts in about five minutes. That's me told! Our South American football expert has spoken. One big group, the top four qualify - with fifth place going into a play-off against the Oceania champions (probably New Zealand). Ronaldo is taking this seriously. Diego Forlan is on stage with Ronaldo now for this most pointless of all the draws. Remember in South America everyone is in a big group. They're only deciding what 'position' each team is, to determine in which order teams play each other. But what does Diego think? I know, I know. Look, I know what you're thinking. We're all thinking it. What does Diego Forlan think about Wales' World Cup qualifying hopes? Luckily BBC Wales Sport found out. "Wales are getting stronger and stronger. Maybe they will have the chance. "Everything is equal, there are no favourites. It is really tough to play football, it does not matter what national team is in front of you. "There are always surprises and many good players in Wales, most of them play in the Premier League. You have to respect that." Amazing. Original Brazilian Ronaldo is on stage. He's asked what his dream is. "Seeing a world free of violence, hunger and poverty." It's pretty straightforward in South America. All 10 teams go into one group so all we'll discover today is who plays who in what order. The only slight complication is that Argentina and Brazil are already designated specific places so nobody has to play them in back-to-back games in a week. The top four teams qualify, with the fifth-placed team going into an intercontinental play-off. If you thought this draw was convulted today, remember it could have been - and has been - worse. The draw for the 1982 World Cup suffered from a number of mishaps and technical problems. With Sepp Blatter, now Fifa's president but then the governing body's general secretary, presiding over the draw in Madrid, there was confusion as several teams were drawn in the wrong groups, before the cages began to jam and break the balls inside. American Samoa, Cook Islands, Samoa and Tonga will contest an opening group. The winners of that join the seven other countries in two groups of four teams (which doubles as the OFC Nations Cup). The top three teams from each of those groups then go into two further groups of three. The winners of each group face off in the final, with the victor playing an intercontinental play-off. It's not for me to suggest this but they may have overcomplicated this a bit, but there's only 11 teams in the whole thing. Some ballet now. The Borus Eifman Ballet apparently. I can't say I'm familiar with this one. Martin in York: Is it just me or is there a distinctly Eurovision vibe to this draw? They're now deciding who will be in the group that follows that round. Patrick Kluivert's Curacao are the first team out in Concacaf. They face El Salvador in round three. Qualifiers in North America have already started with two rounds completed. The 10 teams who have come through that, as well as Jamaica and Haiti, will be drawn in two-legged encounters. After that the bigger teams will come in for two more rounds of group stages. Three teams qualify automatically from the final 'Hexagonal' group with a fourth entering the intercontinental play-offs. The winners of each tie progress to round two. Asia is the only continent without a draw today - qualification is already under way there. Four teams go through, with a fifth going into the intercontinental play-off. They are having a little chat about Asian football. North American draw starts very soon. We're a few minutes behind schedule by the way. The African draw is still going by the way, nearly finished. We'll let you know how that's gone once it's all finished. European teams should "force the issue" of boycotting the 2018 World Cup, says former Football Association chairman David Triesman. He cited the controversy regarding the process which led to the winning bid and racism issues in Russian football. "My basic proposition was that Uefa as a whole should do it and the key reason was to force change through Fifa," he told BBC Sport. "That change has not happened. I think it's worth trying to force the issue." Paul Alexander on the BBC Sport Facebook page: As a Welshman, I'd like our group to contain the Isle of Wight, Isle of Man, Jersey, Lapland and Scotland. Cameroon legend Samuel Eto'o has just drawn out his country out in the African draw. It's a Cameroon face 'either-or' job at this stage as they come into the second round. We'll let you know at the end of this long draw who's got who in Africa. What are the best - and worst - scenarios for the home nations? As top seeds, England and Wales have guaranteed avoiding the other top sides in Europe. Theoretically. However, from pot two they could still face Italy (currently ranked 17 in the world) or France (ranked 22), while trips to the likes of Sweden, Poland or Ukraine would prove tricky. Wales, Northern Ireland and Scotland could be drawn into a group of five teams instead of six - which may help their chances. England must play in a group of six. Throughout the live text we'll tell you what we think are the best and worst-case scenarios from each one. First up in the 'proper' draws, it's Africa. The 26 lowest-ranked sides will be drawn in two-legged encounters to be played in October. The winners of those will then be joined by the other 27 for a second two-legged round. The second-round victors go through to five four-team groups, with the winners of each qualifying for Russia. Zimbabwe have already been expelled for failing to pay former coach Jose Claudinei Georgini. So this means the fourth best sides in Asia and North America meet, while the Oceania champions (normally New Zealand) face South America's fifth best side. Portugal, Denmark, Northern Ireland, Bulgaria, Macedonia (NI might take that.. & party). They're now deciding who faces who in the intercontinental play-offs for the World Cup. South America, North America, Oceania and Asia are the four. Andrew in Richhill: Hugely important couple of hours coming up for the Home Nations' hopes of making it to the 2018 World Cup. This year's European Championship qualifiers have shown that all of England, Scotland, Wales, Nothern Ireland and the Republic of Ireland are competitive enough and capable of mixing it with the best in Europe. The chances of World Cup qualification are good, a decent draw would really help matters too. Woeful banter as Fifa general secretary Jerome Valcke starts flirting and kissing the female host. This your first Fifa ceremony pal? Zenit St Petersburg striker Hulk has been replaced as a draw assistant today by Russian Alexey Smertin "due to the Brazilian's club commitments". Earlier this week Hulk said racism happens at "almost every game" in the Russian league. Those two incidents are totally unrelated I'm sure. And now the dancers are doing some freestyle football skills. What a world (cup qualifying draw). Oh my, it's a Russian-sounding instrumental 'Let's get the Party Started' by Pink with a lot of dancing in traditional outfits. I was not expecting that. Now we've got some traditional Russian music and dancing and people dressed as weird stuff. I might just give you more details on the draw to be honest. Sepp Blatter gets a good round of applause as he finishes his speech and thanks Russian President Vlad Putin. Indonesia and Zimbabwe have been disqualified, while Russia qualify automatically. Every other team is attempting to qualify.Image caption: Indonesia and Zimbabwe have been disqualified, while Russia qualify automatically. Every other team is attempting to qualify. "There is no bigger event than Fifa's World Cup. It will be a wonderful moment for the people of Russia, the rest of the world and football too. "Hundreds of thousands of people will come to Russia for the first time in their lives. They'll be met with warmth, friendship and real Russian hospitality," Blatter continues. This is outgoing* president Sepp Blatter's first overseas trip since Fifa was plunged into turmoil by criminal investigations into allegations of systematic bribery. But he is "a victim", according to the man in charge of the Russia 2018 World Cup. Alexei Sorokin told the BBC that the 79-year-old Swiss was "a very brave person". "He has always been a friend of our country," said Sorokin. *by outgoing I mean he's leaving, not he loves to mingle at parties. Oh actually he's doing some of his speech in English! "For the first time all 209 Fifa countries have applied to qualify," Sepp tells us. And then gives a shout-out to Bhutan who got through the first round of Asian qualifying. Konstantin Palace, St Petersburg - not too shabby. Vladimir Putin is speaking (in Russian obviously) and Roy Hodgson is holding a translating box up to his ear. "The World Cup will definitely enhance the reputation of football in one of the biggest countries in the world. It's wonderful for the neighbouring countries too," he says. "It's crucial for us to make the teams feel comfortable so they can focus on the games. We will make every attempt to guarantee security." Fifa president Sepp Blatter and Russia President Vladimir Putin come onto the stage to a gentle smattering of applause. Very gentle. A simple enough debate topic, let us know who you support and who you want your side to draw, whether you're backing England, Northern Ireland or Cape Verde. Use #bbcfootball on Twitter, 81111 on text (UK only, please let us know your name) or on our Facebook pages. OK so what's going on? Here's the timeline for today. We'll let you know the format for each one and who's playing who - as well as building up to the European draw throughout our live text. It won't surprise you to know there'll also be some video montages, acts and waffle between these times. If your first thought when seeing this live text was "They're doing the draw for the next World Cup but we're barely over halfway through Euro 2016 qualifying?!" then you're not alone. That was my reaction when I was asked to do this during the week. But it's happening and there's no better place to follow it than here - you can watch the whole thing live on this page as well as follow my chat and have your say.